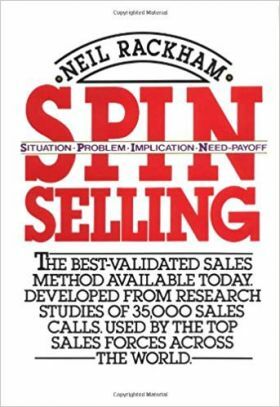 Minimum quantity for "SPIN SELLING (HB)" is 1. Written by Neil Rackham, former president and founder of Huthwaite corporation, SPIN Sellingis essential reading for anyone involved in selling or managing a sales force. Unquestionably the best-documented account of sales success ever collected and the result of the Huthwaite corporation's massive 12-year, $1-million dollar research into effective sales performance, this groundbreaking resource details the revolutionary SPIN (Situation, Problem, Implication, Need-payoff) strategy.